"For exploring a major political issue the most personal and deeply felt manner, a Peabody Award goes to Die in Jerusalem"
Ever since 17-year-old Rachel Levy, an Israeli, was killed in Jerusalem by a Palestinian suicide bomber, her mother Abigail has found hardly a moment's peace. 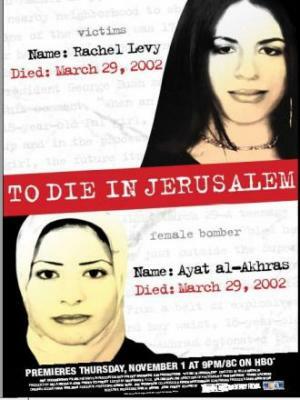 Levy's killer was Ayat al-Akhras, also 17, a schoolgirl from a Palestinian refugee camp several miles away. The two young women looked remarkably alike. TO DIE IN JERUSALEM unabashedly explores the Palestinian-Israeli conflict through the personal loss of these two families. The film's most revealing moment is in an emotionally charged meeting between the mothers of the girls, presenting the most current reflection of the conflict as seen through their eyes. “To Die in Jerusalem” traces the efforts to bring the mothers of the dead girls, who live less than four miles apart, face to face for a meeting that Rachel’s mother, Avigail Levy, said she believed would be cathartic as well as a symbol of hope, a chance to transcend entrenched hatreds. Ultimately, stymied by fears of venturing into enemy territory, cultural differences and the bureaucracies of war, the two meet only by satellite, unable to bridge the physical chasm. The emotional gulf proves equally unfathomable. At the time of the bombing, Hilla Medalia was living in New York. The story of the girls struck her as a way to show the conflict in a manner that even those who didn’t follow the situation closely could comprehend. For: Israel, Palestine, Middle-east, Political Science, Conflict Resolution, Woman & Film Studies. $250 DVD for library & PPR (Public Performance Rights) when no admission fee is charged. $300 for first screenings with paying audiences. Add $100 for 3 year license for streaming rights from institution's own internal server.